When a bodybuilder hits a double biceps, people may be under the assumption that it is just looking like a pair of biceps. However the experienced eye will quickly notice whether or not the athlete has paid attention to the triceps to balance out his arms. And if such a bodybuilder will be onstage, his placing could easily make him commit suicide. So the proper triceps development is an absolute need to every bodybuilder who respects himself. I use the exercises described below in my triceps workout routine because they affect my triceps directly and work the muscle from different angles. It pumps the triceps thoroughly and makes my arms grow. I begin my triceps workout with lying barbell extensions using cambered bar. It’s a powerful movement and one of the best mass building exercises. First set is warming-up set for 20 reps.
Then I load up a bar to make 6-7 strict movements finishing with 2-3 forced reps. I do 3 sets of this exercise. It’s important to use a full range of motion stretching triceps at the bottom and squeezing it at the top. The next exercise is cable pushdowns. It’s good flushing movement. I use medium-length straight bar. Keeping a body as straight up and down as possible, tuck the elbows in and concentrate on the triceps. Each rep is strictly controlled and concentrated. At the bottom position squeeze the triceps for a second or two. Usually I do 3 sets for 12-15 reps.
After doing cable pushdowns I continue with dips. This exercise blasts the triceps and works every part of the muscle. Use a little wider than shoulder width grip and hang a plate between your legs for some added resistance if you can do more than 15 full reps.
Keep a body from leaning too far forward (if you lean too far forward it turns into more of chest exercise). 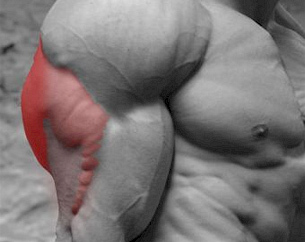 Do not forget to squeeze your triceps at the top. Do 3 sets for 12-15 reps. The last triceps movement is seated one arm behind-the-neck dumbbell extensions. It will help you to make your outer triceps stick out from the side. To maximize the intensity of the pump you have to use the fullest range of motion you can get without going to the resting point. Do not relax your triceps at the end of the movement. You have to feel a tight stretch at the bottom and a hard squeeze at the top for a maximum peak contraction. 3 sets for 15 reps will be optimal. Obviously, the same exercise affects different people differently depending on one’s body type and many other reasons. Now I will explain a method how to pick up a right exercise exactly for you. It can be applied to any muscle group. Choose an exercise you would like to check whether it works a part of the muscle you wish to improve. Make 6-8 sets for 12-15 reps of that one exercise. After that you will definitely see the part of your muscle that has got the most of pumping. And you can easily realize what muscle part the exercise affects. Hence you can make a right decision: to use it or not and how to use it and which exercises to combine with. was just wondering If I could get some workouts for, bigger arms , shoulders , chest and traps.. Please please please please please please please please please please please please please please please please please please please please please please please please please share the photos as well because it is very easy to understand . please send picture that show the process clearly. Thanking in anticipation.